How do you treat a lying, biased reporter? How do you treat a reporter who reports on things he couldn’t possibly have seen, ignores video evidence that disproves what he is reporting even though it is available before his article is published, writes a laughably biased article that is easily proven wrong, lies about easily verifiable facts and then brags about how he is, in fact, biased and writes with an agenda? When his lies and bias are against Israel, you give him an award, of course! JOURNALISTS from the Herald won six categories at this year’s Walkley Awards, which recognise Australia’s best journalism. 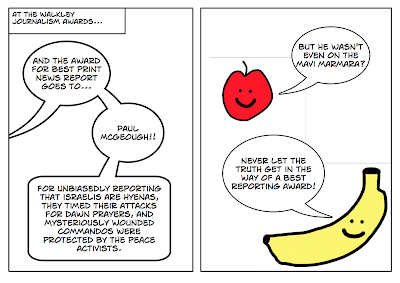 In the event’s 55th year the chief correspondent, Paul McGeough, won the award for the best print news report for his story ”Prayers, tear gas and terror”, which covered an attack by Israeli commandos on a flotilla of aid ships heading for Gaza. The judges praised McGeough for his courageous journalism and writing excellence and commended the story for its newsworthiness and degree of difficulty. Why would McKeough tell lies about Israel? I like to think that he is simply doing his part to fullfill one of the prophecies of Jeremiah. He is searching for the sins of Israel and will leave no stone unturned. The fact that no iniquity is found upon examining his accusations verifies the prophecy. Jer 50:19 And I will bring Israel again to his habitation, and he shall feed on Carmel and Bashan, and his soul shall be satisfied upon mount Ephraim and Gilead. Jer 50:20 In those days, and in that time, saith the LORD, the iniquity of Israel shall be sought for, and [there shall be] none; and the sins of Judah, and they shall not be found: for I will pardon them whom I reserve.